The Pork Menudo Recipe is a delectable dish composed of pork stew combined with liver cubes, garbanzos or chickpeas, potatoes, tomato sauce and many spices. The good thing with Pork Menudo is you can skip some of the ingredients, if you don’t like the taste of the liver you may not add it depending on your choice. You may also use Chicken meat instead of pork meat or you can mix them both depending on your taste. It takes time to prepare the ingredients because of the slicing and chopping but cooking this dish is very easy because all you have to do is put everything in. 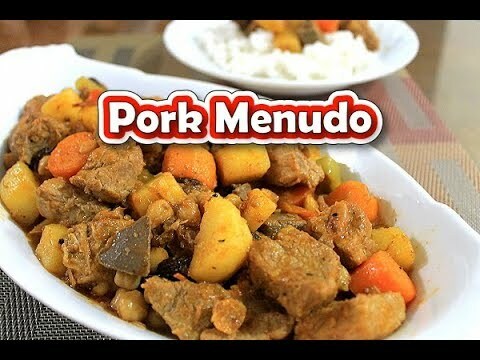 Though, Pork Menudo sounds like a Spanish food it is absolutely a classic Filipino Recipe. Here’s our version of the delicious Pork Menudo Recipe, give it a try let us know your feedback. Using a small bowl, dissolve the Annatto powder in 1/2 cup of water, then set aside. In a frying pan, pour Canola oil and apply heat. Add onions and garlic, stirring occasionally, until cooked. Add pork and fry then Add fish sauce to the Pork and cook for about 3 minutes. When the Pork is lightly brown in color, add tomatoes and cook, mash it using the back of spoon, until softened. Add the Annatto water and remaining water and bring to boil. Lower the heat, then cover and cook for about 40 minutes or until pork is tender. Add the garbanzos, potatoes, and carrots, then mix well. Cover and continue to simmer for around 5 minutes or until potatoes and carrots are tender. Add the green bell peppers, raisins and liver then cook for another 4 minutes or until liver is cooked. Pork Menudo Recipe is a delectable dish composed of pork stew combined with liver cubes, garbanzos with tomatoes and potatoes. You can always find this dish in special occasions for many Filipino homes. The recipe does sound delicious, except I’d probably omit the pork liver. Organ meats are generally sold in my area, and the cost of shipping isn’t worth the expense. I think I would add bits of sausage instead. Sounds like a nice comforting hearty meal. Our all time favorite na pang-ulam at pang handa. hi..anu ba kaibahan sa menudo tsaka afritada pereho lng ata tama b? wow talap! i hope maperfect! Thank you so much for sharing this recipe. This is my first time to cook menudo. My boyfriend can’t wait to taste it. hihi! More power! HAY…GALING NAMAN NILA MAGLUTO,TRY KO YAN !!!!!!!! Hmmm! Thanks loved it but the way it was prepared is somewhat different on how we do it. Nevertheless its still came out scrumptous and good. Thank’s for sharing such a super duper recipe w/ all of us.I made this for my husband last weekend and it went down a treat, i was so happy 2 see him enjoying a meal i made w/o ballsing it up. hmm! aang sarap grabe hahanaphanapin ko talga to,,,,. ang sarap tlaga ng minudo gustong gusto ko yan. wow….sarap….sna mtutunan ko rin 2…. mukhang masarap ah.yun niluto ko eh lasang tomato sauce eh hhahahaha ang sama ng lasa.try ko to mukhang masarap eh.